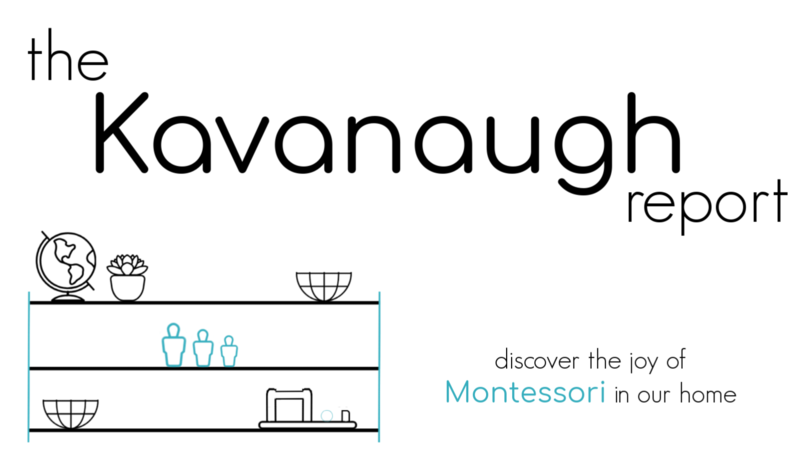 In addition to Nora's toys, I wanted to create a safe sensory experience for her. 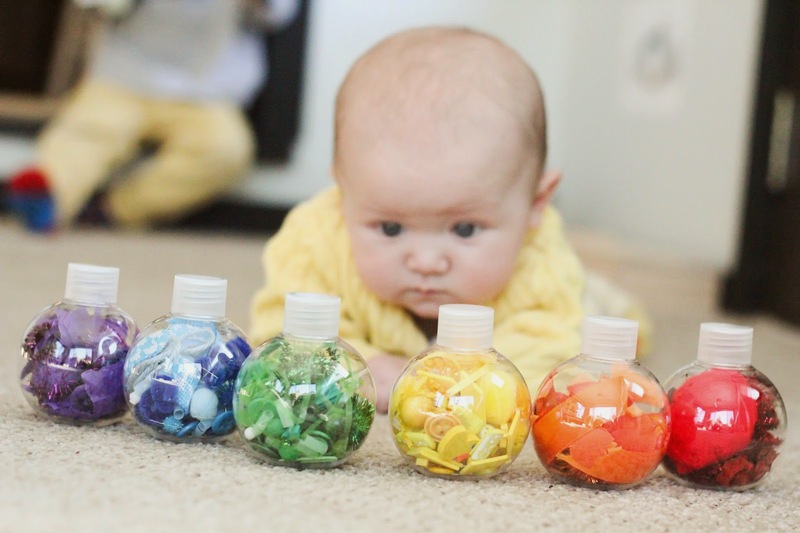 What better than mini-rainbow bottles for my rainbow baby. I had seen this pin, around Pinterest and knew I wanted to do something similar. 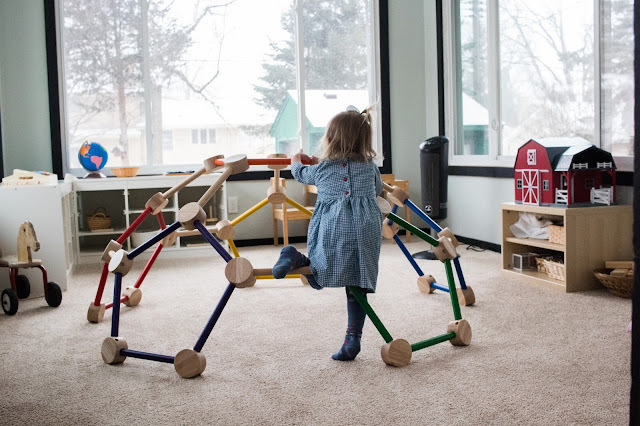 But, I wanted something smaller and more manageable for a young baby. I used small plastic bottles. 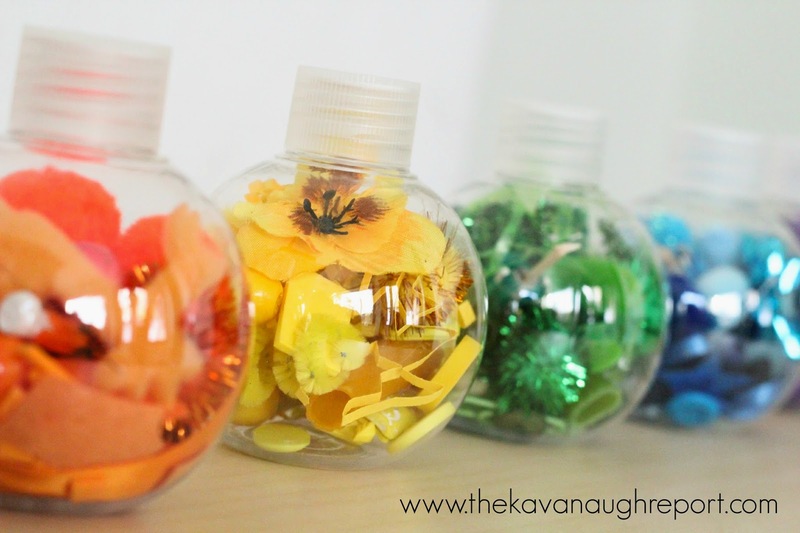 They are refillable craft bottles meant for sand art and other similar projects. The objects are just things I had at home. 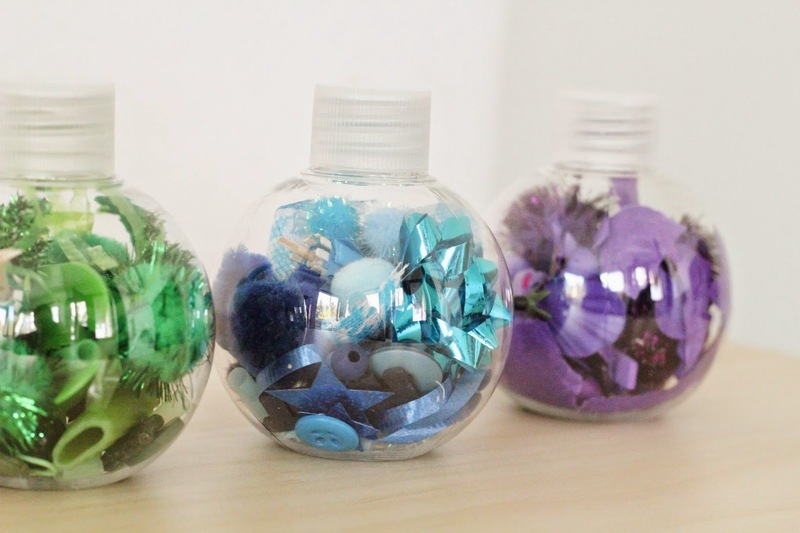 Every bottle is different, but the objects included wooden beads, Pom-poms, foam pieces, buttons, ribbon, shredded paper, wrapping bows, fabric flowers, small scraps of fabric, paper clips, colored pasta, mini umbrellas, mini erasers, confetti, and other similar objects. Pretty much if it fit into the bottle and was the right color, it went in! I loved that they all turned out a little different from each other. They are truly a unique sensory experience on their own and as a group. Henry has been obsessed with these -- especially the yellow -- since I finished them. Nora has been completely mesmerized when I introduce a bottle to her. She also enjoyed studying the group as a whole. It turned out to be a great way for her to get some tummy time in. The bottle is an easy size for her to hold and to watch. They are pretty lightweight so I don't have to worry about her getting hurt if she drops it. 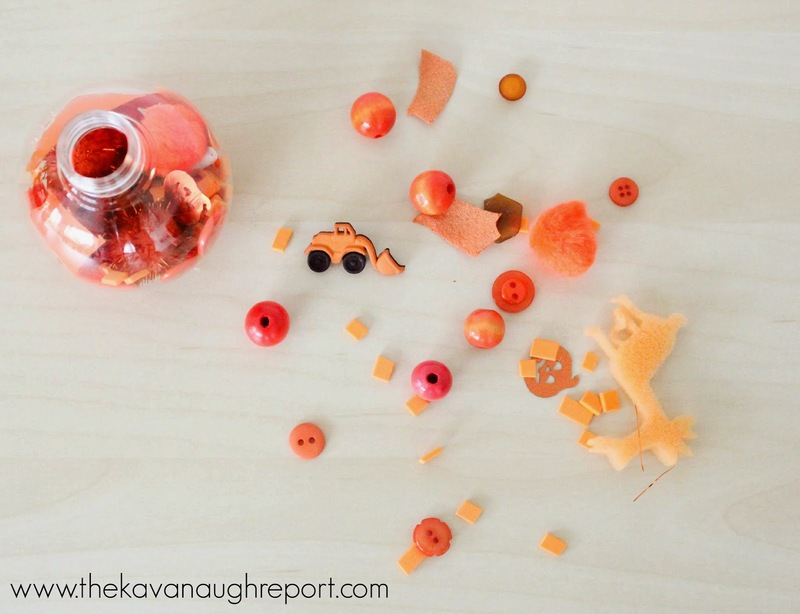 After the success of these, I can't wait to make some other themed sensory bottles for her! 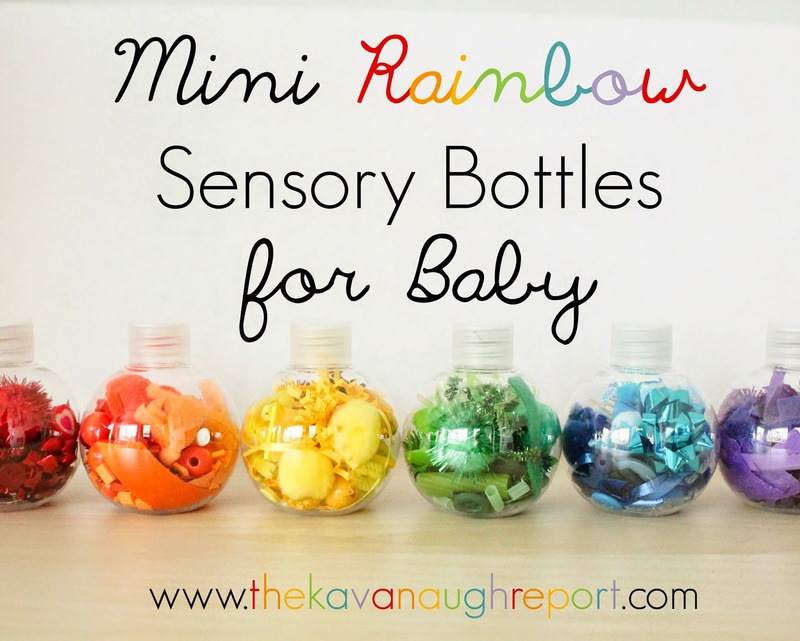 Does your baby like sensory bottles? 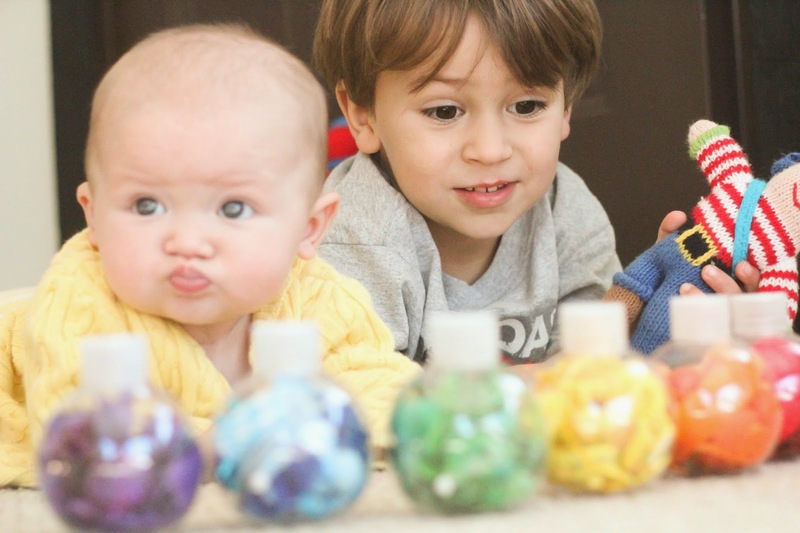 If you liked this post, don't miss: Color Themed Treasure Baskets for Toddlers; Rainbow Sensory Jars -- An Introduction to Colors. 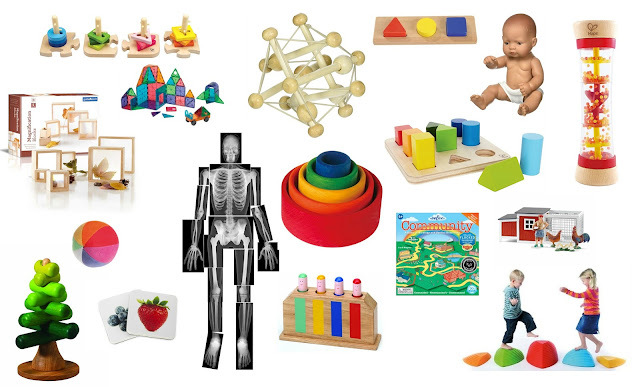 Other ideas can be found on my Montessori Baby Activities or Baby Play Pinterest Boards. You already know I adore these so much. 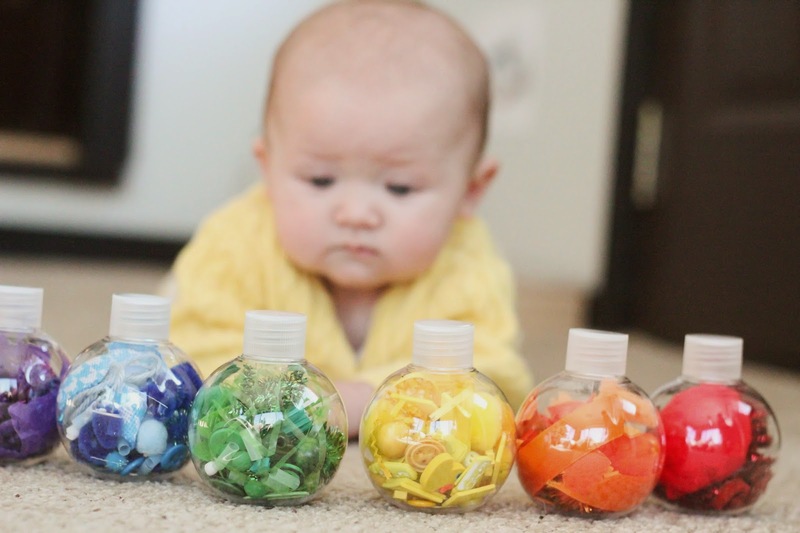 Such wonderful colors and I love seeing the tummy time and concentration on her face while looking at them. Sharing and pinning this one! I just bookmarked this! Great idea! 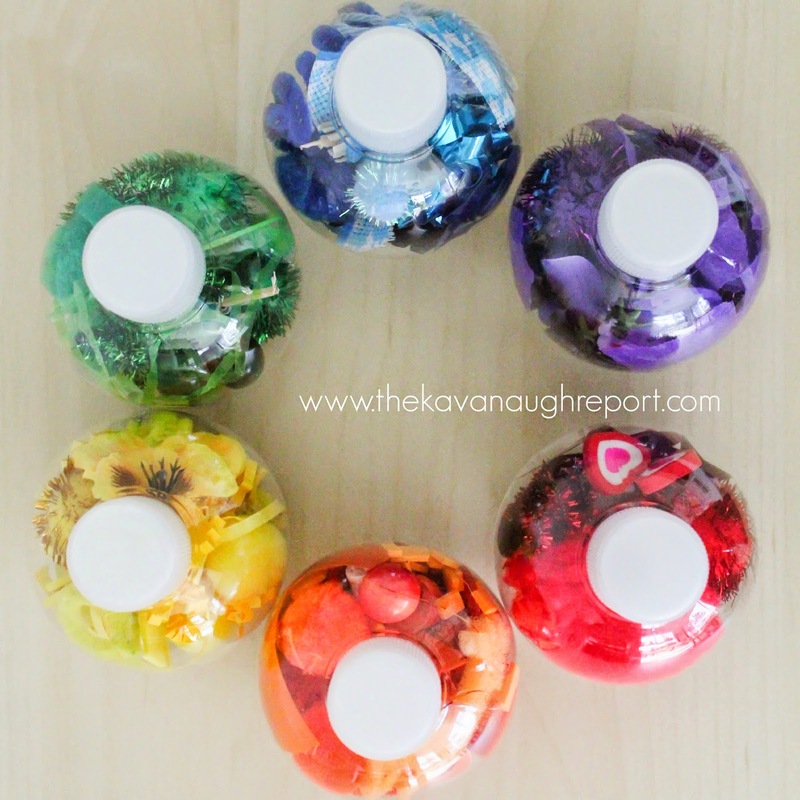 These are just the cutest little sensory bottles, so colorful. I just love the expressions on your little one's face. What a neat idea. 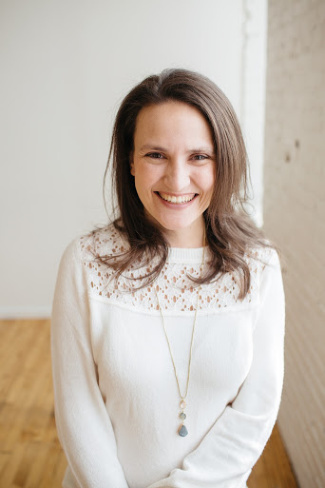 Thanks for stopping by and sharing with Toddler Idea Tuesday. I am pinning this. Also wanted to let you know your post was randomly selected as one that will be featured this week. I invite you to stop by again to share your ideas. These look so fun and colorful! What a wonderful idea! 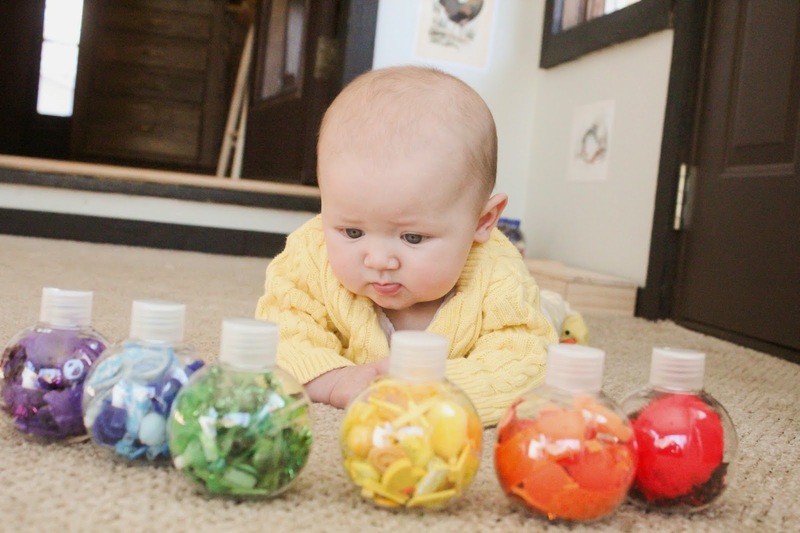 I love the pictures of the baby looking at the bottles like ooh hh as he try to get to them. Travelling along with your baby is one nice time to be with him, however it can be terribly exhausting and exhausting particularly once your baby's not in the least snug, and wondering the proper baby provides required for the trip is kind of a nuisance since you cannot bring all the kid's stuffs at the side of you click here.